Can even a decent-sized motorhome be fully family-friendly? 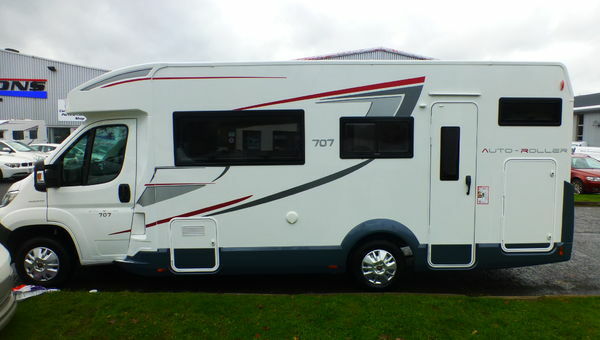 Six into one can go – if you choose the right motorhome. While most folk go motorhoming as couples, there’s always been a proportion who have young children to cater for – or even those who like to take their grandchildren on tour occasionally. Luckily, there are plenty of manufacturers out there who include full six-berth vehicles in their line-ups. Here, we’ve chosen six top motorhomes that can provide for up to six people – for travel as well as sleeping. Consider beds as well as travel berths. Some manufacturers still offer the flexibility of more sleeping accommodation than actual belted seats. Think about payload. You may even need to go for a chassis upgrade if you’re thinking of using a vehicle to its fullest capacity. Note, also, that any fitted optional extras will eat into the load-carrying margin. Storage is another major issue – and not just of the vehicle itself. On-board, you need to make sure there’s sufficient cupboard space for all the family’s belongings. Hire before you buy. Lots of specialist hire companies have six-berths on their fleets – it’s a good opportunity to try before you take the plunge and actually buy. 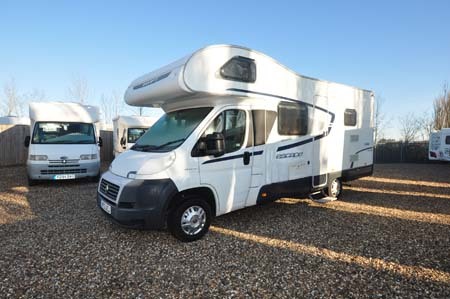 You’ll also see some ex-hire six-berth motorhomes on the secondhand market. Beware those showing signs of having had a particularly hard life. Kitchens count for more when it comes to families. It’s not just about equipment, although a proper cooker with oven and grill – possibly also a microwave – and a bigger fridge/freezer will always come in handy. 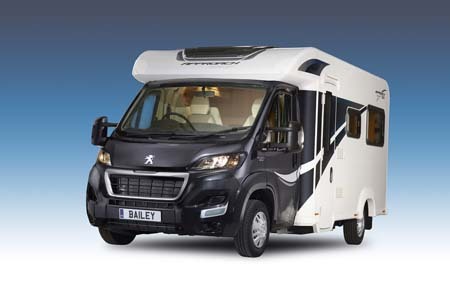 Bailey’s unique way of building its motorhomes sees all its range based on Peugeot Boxer cabs with Al-Ko chassis, with bodywork using the company’s Alu-Tech construction method, backed by a six-year bodyshell integrity guarantee that’s transferable as well as offering the option to upgrade to 10 years. 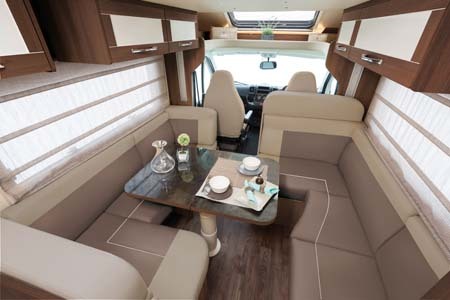 A low-profile coachbuilt, the interior sees a rear, U-shaped lounge, plus a doubled dinette behind the driver that offers full travel seating with three-point belts for four people. 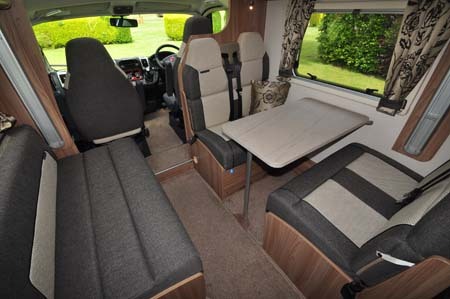 Bailey has also pioneered rear seat safety in its motorhome range. Plus, it was the first UK manufacturer to offer a drop-down double bed, as here. 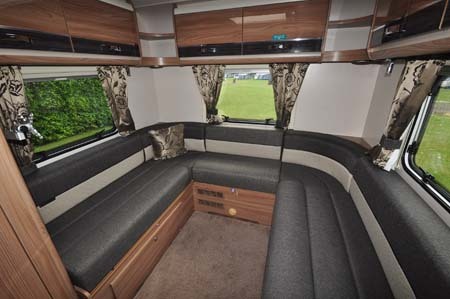 The kitchen, occupying the mid-‘van nearside, includes a decent 103-litre fridge, and a full Thetford Caprice cooker with dual-fuel hob and separate oven and grill. Plus, there’s a microwave oven as part of a standard specification that really does want for little. Indeed, the kit list also extends to Alde heating and hot water. Overall body length is 7.45m and the chassis, rated at 3,850kg, offers a generous 633kg payload. At 2.41m, it’s that bit wider than its peers, too. Not the cheapest – and most folk also go for the £995 Lux Pack – but there’s an upmarket feel to this Bessacarr, with features like an electric sunroof, twin camera reversing system, microwave oven, Tracker Retrieve and more. It’s also on the Maxi version of Fiat’s Ducato, which is rated at 4,250kg and provides a whopping 930kg payload. It’s that bit bigger, too, at 7.75m long. 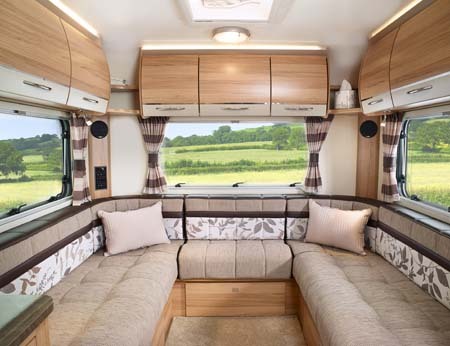 The floorplan offers a generous U-shaped rear lounge and a forward double dinette, over which is an electrically-operated drop down double bed, complete with Duvalay Duvalite mattress. The kitchen has a Thetford cooker (dual-fuel hob, separate oven and grill) and Dometic 8-series fridge with AES (automatic energy selection) and removable freezer section. Directly opposite the kitchen, the washroom is plastic-lined, and includes a Thetford bench toilet (often easer to clean around than a swivel-bowl model). 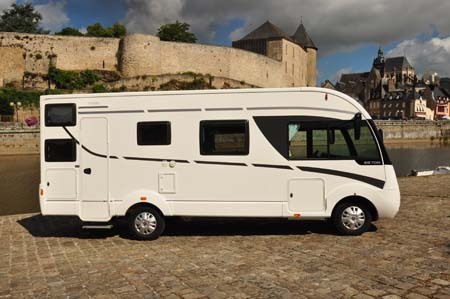 Another rear lounge model, the long-established Autoquest 180 is 7.34m long and is based on a 3,500kg Peugeot Boxer chassis that provides a 515kg starting payload. 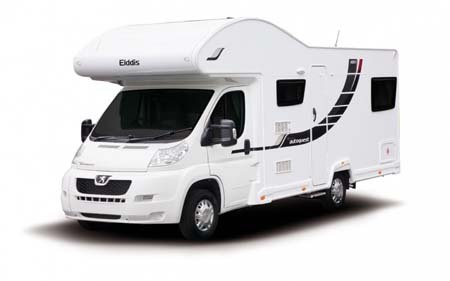 It’s an overcab coachbuilt that uses Elddis’s SoLiD construction and now comes with a GRP skin to the outer floor, for even better protection from the elements. Latest versions have an improved internal specification, too, with items ranging from leisure battery to Whale 4kW heater. Look out, also, for dealers’ special edition versions of the Autoquest 180. Typically, they offer a much higher specification at prices that aren’t much more than the standard unit. From a company that’s part of France’s Rapido group and specialises in budget-priced A-classes. It’s on a 3,500kg Fiat chassis-cowl and it’s some 6.99m long and yet it’s a full six-berth, although there’s only a 545kg payload. It doesn’t look particularly “budget” either, thanks to external features such as coach-style mirrors and GRP-clad bodywork. And there’s no doubt an A-class gives you a real king/queen of the road feeling when you’re travelling. Inside, you instantly grasp the benefits of an A-class bodyshell – not just because of the extra space, superior insulation and large double bed dropping down from the cab roof, but also the rear bunk beds and a massive lounge where you really can ring the seating changes. Again, features ranging from the 150-litre fridge/freezer to Dometic ceramic-bowl toilet to soft-close drawers and more are far from budget offerings. There are some compromises in the kitchen area, though, in terms of space. And the lounge’s ply seat bases are a bit flimsy. It’s still an incredible price, especially for an A-class, even though you’ll want to factor in a few options, starting with the Itineo Pack at around £2,000. More info www.itineo.co.uk or for our detailed review. Yes, you could actually order an Auto-Roller 707 as a seven-berth, although that also entails upgrading the chassis to 3,650kg. Amazingly, its also a low-profile, with the sleeping arrangements starting with an electrically operated drop-down double bed in the lounge! 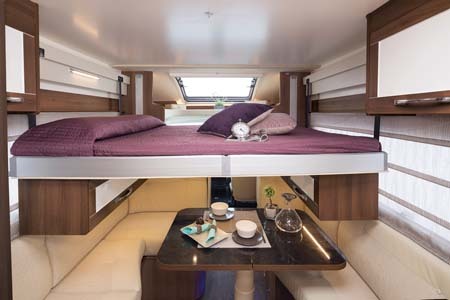 At 7.30m long, there’s still plenty of interior space thanks to rear bunk beds, while storage is helped by the facility to fold up the lower of the two bunks for some exterior-access garage space. Just remember to include the £999 Driver’s Pack in your budgeting. The 10-year construction integrity warranty shouldn’t be dismissed here either, for bodywork that features a GRP exterior and Styrofoam insulation. Swift’s two top Escape models have the same price, but the big difference is the end lounge of the 686 compared to the rear bunk beds of the 696. It’s the latter that’s arguably the more family-friendly, especially if you have young children. 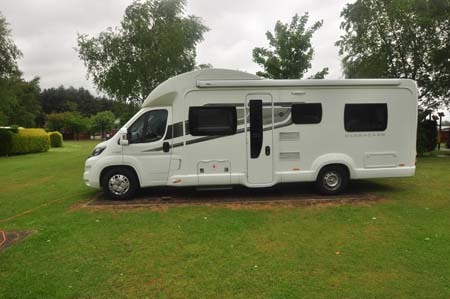 Just bear in mind here if you do want a full six-berth, it’s a £149 extra to include a sixth seat belt, at the same time taking the vehicle up to a 3,650kg MTPLM (Maximum Technically Permissible Mass). 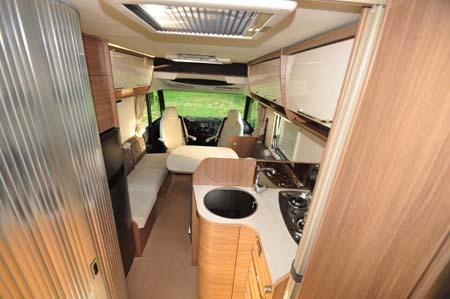 There’s also a £1,295 Comfort Pack to consider and, like all Fiat Ducato-based models, there’s always the choice of Comfort-Matic automatic transmission. 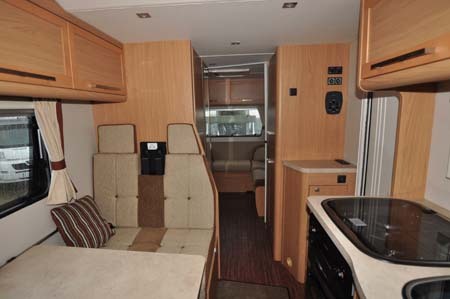 More info www.swiftgroup.co.uk or read our review of the 2015 model. 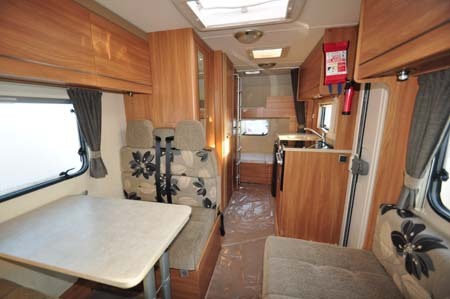 Got any advice on six-berth motorhomes to pass on to others? We’d love to hear your views. Feel free to add your comments below. Good looking vans which leave a difficult choice to make.